Julius Blüthner founded his piano company in Leipzig in 1853, and the firm soon became one of the world's leading manufacturers. Blüthner pianos are renowned for their richly expressive tone and stability of tuning. Many composers including Liszt,Wagner and Shostakovitch have used Blüthner pianos, as well as performers such as Wilhelm Fürtwangler, Yehudi Menuhin, Igor Markevitch and Artur Rubinstein. Queen Victoria and Emperor Franz Josef of Austria owned a Blüthner piano, and so do many opera house and concert halls throughout the world. The Blüthner piano in the studio was built in Leipzig in 1908. An almost identical instrument of 1910 can be seen in the Kunsthistorisches Museum in Vienna. 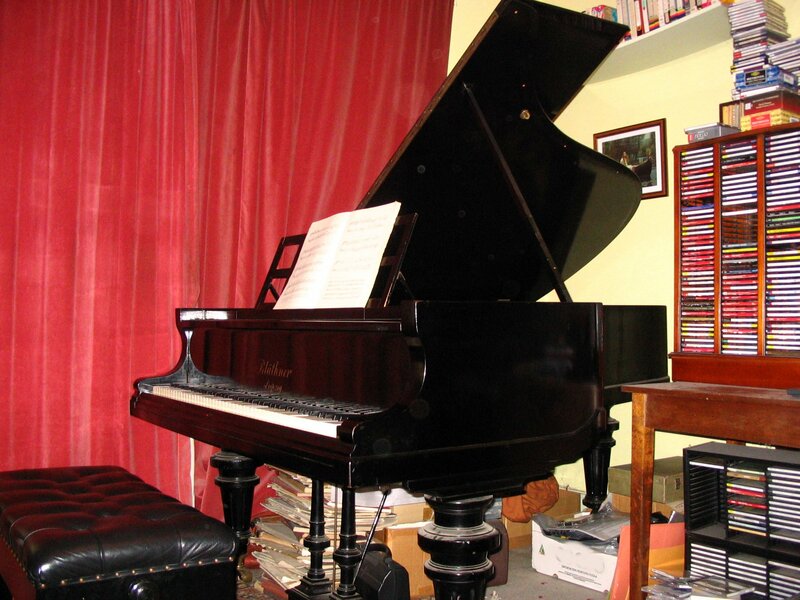 The piano in the studio was last reconditioned in 1992 by Blüthner specialist, Anthony Fortune, who restored the instrument to its former glory. It has since been maintained by Frank Evans and Robert Parr. www.bluthner.co.uk. The clavichord is the true predecessor of the piano since the strings are struck by metal tangents attached to the inner ends of the wooden keys, rather like the hammers on a modern piano. The clavichord produces a very quiet, delicate sound, but unlike on the harpsichord, the volume can be varied by the player. Because of its quiet sound, the clavichord is not used for public performance. It was invented in the Middle Ages and flourished until the end of the 18th century when it was replaced by the more powerful pianoforte. Members of the Bach family used the clavichord for composing. 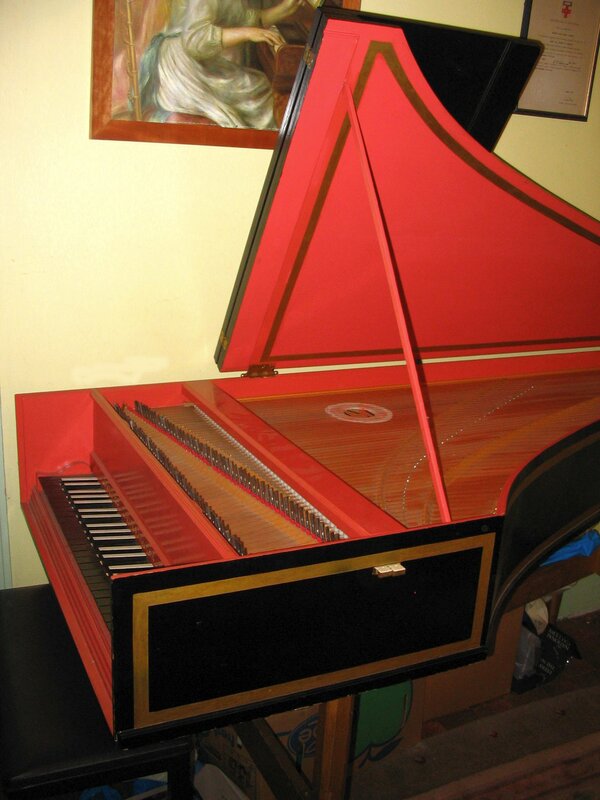 A harpsichord is a keyboard instrument commonly used between the 16th to the 18th centuries. 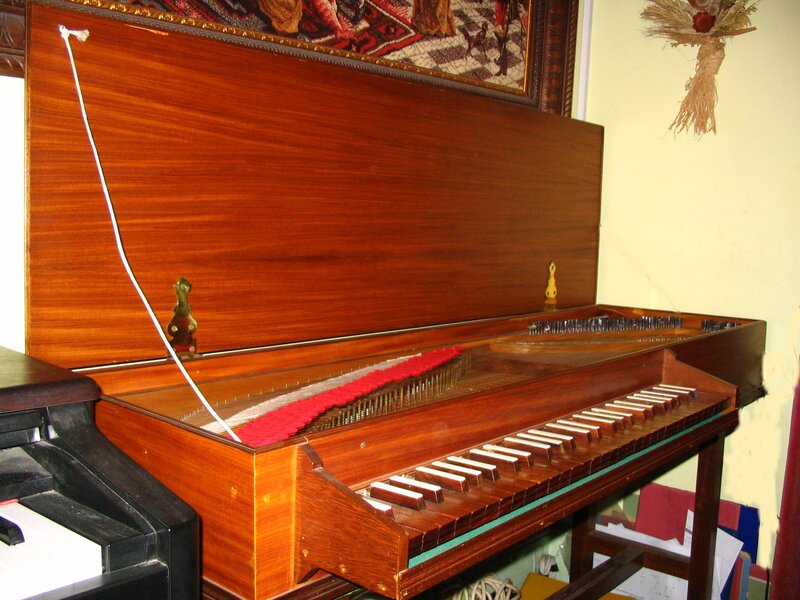 Unlike the clavichord and piano, the harpsichord uses a mechanism whereby the strings are plucked by quills or plectra. 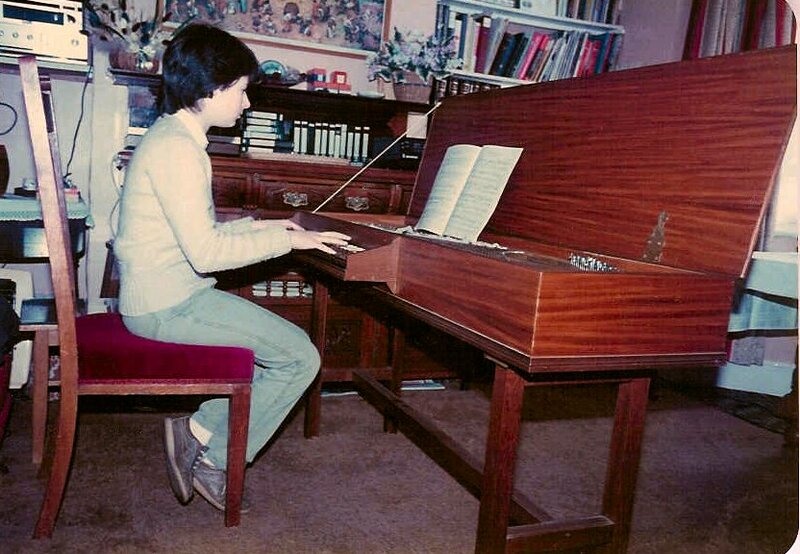 During the 20th century many new harpsichords were been built and old ones restored, as musicians tried to make their performances sound as they would have done years ago. Restored harpsichords and other keyboard instruments such as early pianos, clavichords, spinets and organs can be seen and heard at Finchcocks www.finchcocks.co.uk described as a "Living Museum of Music",in Goudhurst, Kent. I have had a long association with Finchcocks and their Directors, Richard and Katrina Burnett, having taken many groups of young people and adults both to give performances there and to listen to the instruments. Past pupils have played there many times on Open days and during the Finchcocks Festival. These have been Renaissance and Baroque instrumental and vocal ensembles as well as my piano students. The single manual harpsichord in the studio is a modern reproduction of an instrument by the Flemish maker Andreas Ruckers, built in the 1640s. 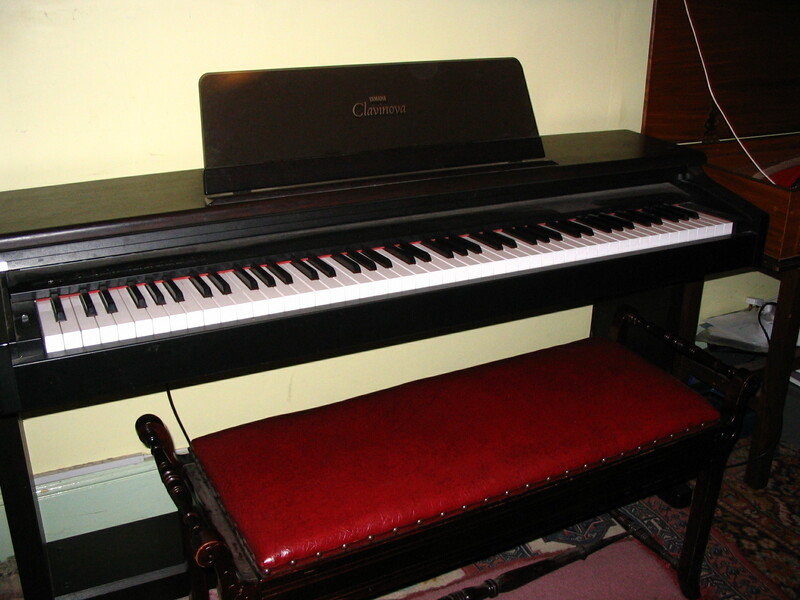 The instrument in the studio is Clavinova Model CLP123. This instrument has proved very useful when my students have been learning concertos and music for two keyboards. Some students purchase an electronic keyboard instead of a piano. The main advantages are that they do not need expensive maintenance or tuning, they are small and fit easily into a corner of a room, and earphones can be used so that the sound of keyboard practice does not interfere with the rest of the family's activities. For details of the current Clavinova range go to www.chappellofbondstreet.co.uk.